Sanchez is the name of our 1984 VW Camper. 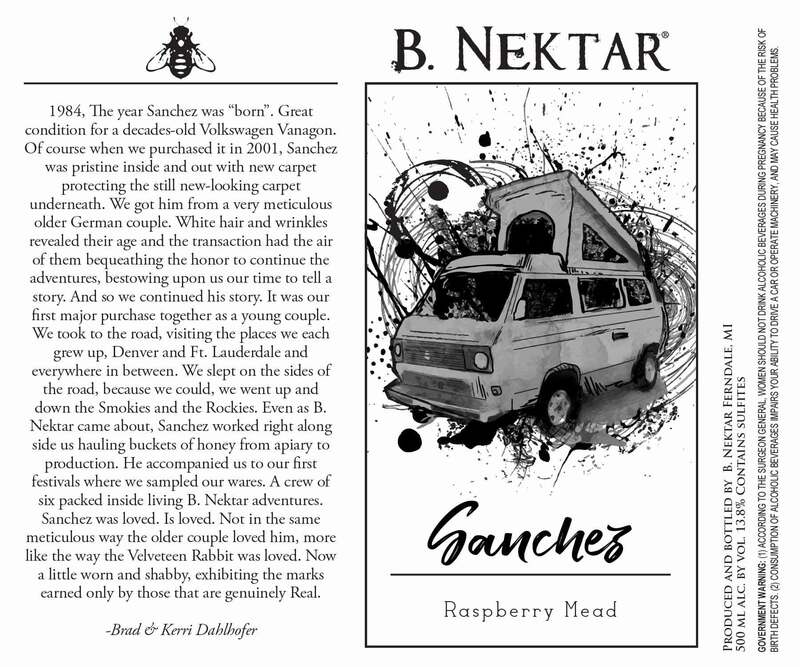 You probably don’t know this, but when we first started B. Nektar we used our VW to transport honey. Many thousands of pounds and miles later, it finally blew an engine. It’s been in storage at the meadery since about 2010. Recently, we finally got a donor engine from a 2008 Subaru. After a lengthy engine-swapping process, Sanchez rides again! And as a tribute to our beloved friend, we are naming this new mead after him. Many of you may have seen the videos posted about the raspberry mead we’ve been making. Well, this is it! Just like Sanchez, this mead is something special. It’s like having a mouthful of fresh raspberries. That’s because we used nothing but pureed raspberries to dilute the honey. No water at all! This one of the most decadent meads we’ve ever created. Those of you who have had a chance to try our recent RJBC release of Boys In the Wood (boysenberry mead) know what we’re talking about. Less than 300 bottles will be released on August 2nd at our taproom. As usual RJBC members get first dibs. This is a whole new era for B. Nektar. Look for more like this in the future.